Google search has gone from plain links to actionable items, structured data and knowledge graph-based goodies. Google has also improved is the ability to show various flight and hotel results, making it a great place to search when you are heading on a holiday or a work trip. Google’s AI can already predict flight delays and find rate information based on peak travel times. And now, the company has added improved price filtering with which you can book your hotels with ease. In fact, with the new update, you can now book a hotel room right from the Google Search results on your phone or web. You no longer have to visit another website to complete the process. In addition to that, Google is also incorporating a way for you to jump to hotel listings of a designated location, which you have already searched for with Google Flights. For instance, let’s say you searched for airfare for a specific set of dates to Dubai. Now, Google will show you a new button to jump right from flights to a set of hotel listings for the same destination with same dates. And guess what? This is backward compatible with flights, meaning if you search for hotels with a specific set of dates first, then you can jump over to the flight’s tab for the same. This is a super handy feature which would make life easier for frequent travelers. Furthermore, Google is also adding a new “More Destinations” tab with which you can see possible locations you may be interested in visiting. And lastly, all your reservations will seamlessly sync to the Google Trips app or show up in the new private Your Trips section. 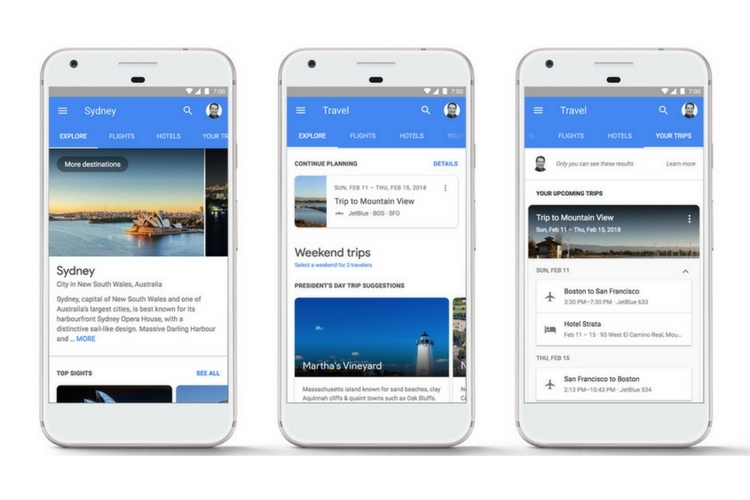 Overall, Google is making it a lot more easier for you to make hassle-free flight and hotel reservation and I am totally psyched to try it for my next vacation.